Word Meanings and Translation In Nepali for "Stopping By Woods On A Snowy Evening". 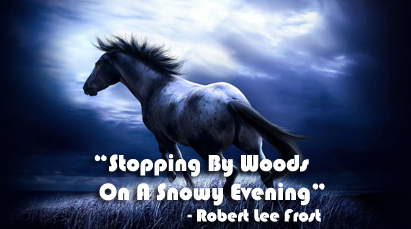 "Stopping By Woods On A Snowy Evening" was written by Robert Lee Frost. Robert Lee Frost was born on 26 March, 1874A.D. He died on 29 January, 1963A.D. He was an American poet but his work was initially published in England before America. He is highly regarded for his realistic depictions of rural life and his command of American colloquial speech. His work frequently employed settings from rural life in New England in the early twentieth century, using them to examine complex social and philosophical themes. He was one of the most popular and critically respected American poets of the twentieth century. Frost was honored frequently during his lifetime, receiving four Pulitzer Prizes for Poetry. He became one of America's rare "public literary figures, almost an artistic institution." He was awarded the Congressional Gold Medal in 1960 for his poetical work. Word Meanings In Nepali Of "Stopping By Woods On A Snowy Evening"
Translation In Nepali Of "Stopping By Woods On A Snowy Evening"
0 Response to "Stopping By Woods On A Snowy Evening | Word Meanings | Translation in Nepali"